As the euro continued its bounce off support at $1.3030 the bulls gathered momentum and took the single currency through the $1.3200 level. The risk-on sentiment was due to an improvement in EU Industrial Production, and the suggestion that another round of stimulus could be on the way from the Federal Reserve. The gains couldn't be sustained however and this morning EUR/USD is at $1.3180 with the immediate resistance level seen around the $1.3220 area. The big test for the bulls will be the stubborn $1.3380 level where they have met stiff resistance in the past. In the forex spread trading markets, the euro made modest gains of 0.2% but still remains range bound. Caution is likely to keep a cap on gains ahead of today's Italian bond auction. The dollar dropped against the euro on Wednesday as equities recovered and Spanish debt yields fell. However, the single currency gave back some of the earlier gains after the Federal Reserve's Beige Book report didn't offer up any new direction on another round of quantitative easing. The negative outlook for equities saw money flowing out of the euro and into the dollar on flight-to-safety moves. However, EUR/USD has settled just above the $1.3030 support which has proven quite resilient over the short term and at the time of writing the market is at $1.3120. The AUD/JPY shed 1.5% on Tuesday as the escalating European debt concerns led to strong safe haven buying of the Yen. 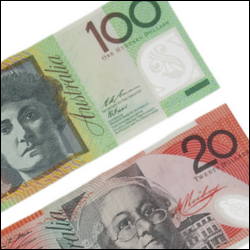 At the same time, the Australian dollar sank as worries about global growth dragged down the commodity currencies which are heavily dependent on the export of raw materials. However, keeping a cap on the declines will be the prospect of more quantitative easing from the BoJ as they attempt to revive their economy. In forex futures trading, the euro continued its correction against the dollar after being rejected by the $1.3380 resistance level. However it appears to have found near term support down at the $1.3030 level. However, the ongoing concerns surrounding Spain will likely keep pressure on the euro whilst the lack of enthusiasm for further stimulus from the Fed looks to keep the dollar well supported. At the time of writing EUR/USD is at $1.3080 and near term support and resistance is seen at $1.3055/30 and $1.3135/60/80 respectively. The BoE announces its interest rate decision at lunchtime. Whilst they might highlight the good PMI data that has been released recently and the probability of avoiding a double dip recession, the outlook remains bleak. No action is likely at this meeting but we could get hints of further assets purchases in H2 of this year. The euro traded lower against the dollar as weak demand at the Spanish bond auction stoked fears that the Eurozone sovereign debt crisis could come back with a vengeance. Also weighing on the euro were disappointing German factory orders and Mario Draghi's dismissal of the need to prepare an exit strategy for the billions of liquidity pumped into the Eurozone given the current fragile state of the economy. At the time of writing the EUR/USD spread trading market is at $1.3135. The focal point of the economic data today as far as the UK is concerned is the PMI services number which is expected to show that the services sector is still in expansion mode with a figure of 53.5. The manufacturing and construction equivalents have both come in higher than expected so far this week and that's encouraging news from a growth point of view, but it's the services sector that makes up the bulk of our economy. The most recent services index was better than expected and since the other PMIs have beaten forecasts, a higher number can't be written off. Also today we get the ECB rate decision, a day earlier than normal due to the Easter break, but nothing too exciting is expected to happen here. However, the spread trading markets will want to here their view on the recent poor data out of Spain and the country's prospects of avoiding a bailout. The euro traded in a tight range against the dollar yesterday until it came under pressure after the FOMC minutes. The dollar caught a strong bid as expectations for another round of quantitative easing faded, sending the euro crashing straight through several short term resistance levels. With ongoing concerns surrounding Spain also exerting downward pressure on the euro, the bulls may struggle to test the $1.3380 level again any time soon. At the time of writing EUR/USD is at $1.3190. In the FX markets, euro bulls once again attempted to break through the resistance around $1.3385 but were swiftly rejected and the euro found itself making a low of $1.3277 before recovering. The sudden turn around in sentiment for the euro was attributed to the disappointing EU Manufacturing PMI and Unemployment rate. Having proved a solid line of resistance, bulls may be weary of attempting another break of the $1.3385 area anytime soon and at the time of writing EUR/USD is at $1.3345. The euro ran out of a bit of steam as the week drew to an end, but momentum started to pick up again over the weekend after news that EU finance ministers will increase the Eurozone bailout funds. This came along with Spain's latest budget report, which outlines plans to cut €27bn in deficit by raising taxes, and has encouraged the euro bulls back into the market. The EUR / USD spread trading market is trading higher this morning at $1.3345 and could push on higher to its next resistance level at $1.3385.